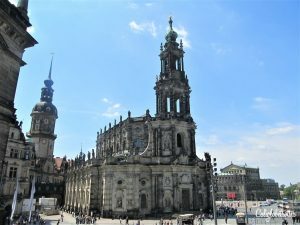 Dresden is the capital of the state of Saxony, just north of Bavaria. Saxony borders the Czech Republic and Dresden is not that far from the border. Just a mere 30 years ago, it would have been unimaginable to visit the city as it was pretty much closed off from the rest of the world. 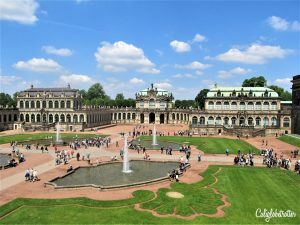 Dresden is in the part of Germany that is considered East Germany that was controlled by the Soviet Union until the fall of the Berlin Wall which reunited East and West Germany in 1990. Dresden has had an interesting history, one that included a very controversial air raid which left Dresden smoldering in ashes. 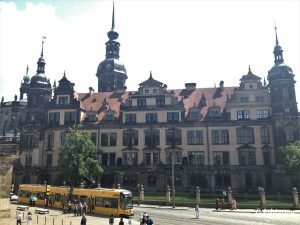 Today, decades from the horrors of WWII, Dresden is up and running again with such vibrancy, you could hardly tell it once had a dark history. But it’s hard to visit Dresden and not see some of the lingering signs of its dark history. 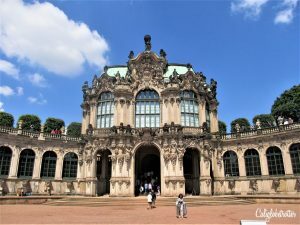 Dresden though with worth a longer visit though if you have time as there are many amazing day trips from Dresden, for example visiting the Bastei Rocks and Moritzburg Castle! 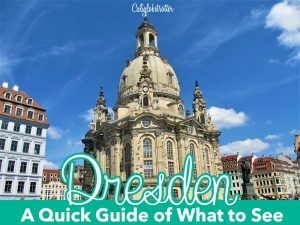 Headed to Dresden? PIN IT FOR LATER!! 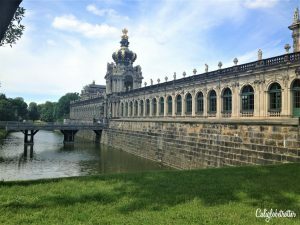 There are many things to do in Dresden, but the first thing I wanted to see in Dresden was the Zwinger which is a beautiful Baroque building which looks like it could be a palace, but it’s not. It was once used to stage tournaments, festivals and firework displays which is completely surround by galleries. You can walk upstairs on a large portion of the building or walk down into the beautiful garden down below. As a WWII history buff, I was really interested in the damage done to Dresden during the war. The bombing of Dresden during the war destroyed almost all of the main city center. The bombing of Dresden is still a heavily debated topic which was carried out by the US and British forces by dropping 2431 tons of high explosive bombs. Today, the city has been rebuilt from the ground up and you can still see scars on the buildings. Across from the Zwinger is the Dresden Palace that to me just looks like a normal fancy building. 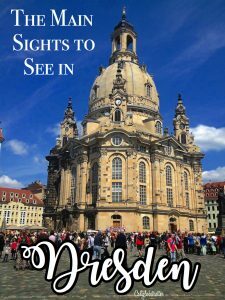 Just behind the Residenzschloss (Dresden Palace) is the Hofkirche, which we took a look at. This is a Catholic church that is built in a predominately Protestant Saxony in 1738-51. Across the courtyard from the Hofkirche is also the beautiful Sächisisiche Staatsoper (Saxony State Opera) which is one of Dresden most iconic landmarks. It took until 1985 to finish reconstruction on the opera house after WWII. 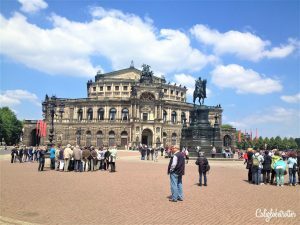 It is also known as the Semperoper after the man who designed and built the Opera House. Not far from here you can find the Fürztenzug, which is a long mural painted on the side of wall facing the street of the Langer Gang (Long Walk) which connects the castle with the Johanneum. 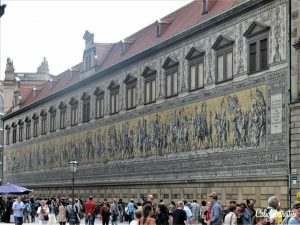 The mural shows the procession of the many rulers of Saxony. It was painted between 1871 and 1876 to commemorate 800 years of the Wettin Dynasty. It is known as the world’s largest porcelain artwork in the world after it was replaced with porcelain tiles to preserve it between 1904-1907. In the other direction from the Hofkirche is a bridge which will lead you to the other side of the Elbe River. Crossing this bridge offers pretty great views of the old town of Dresden. As we were crossing it, the St. Christopher’s Day Parade was proceeding down the bridge as well blaring their loud music. So we decided to sit down at a beer garden just at the end of the bridge which offers a great view of the bridge and the town. You could see that the Frauenkirche once again beautifully dominated the skyline of Dresden after missing in action for such a long time. After our beer, we headed on further into the North East of the city. This part of town is considered to be the Neustadt (New town). 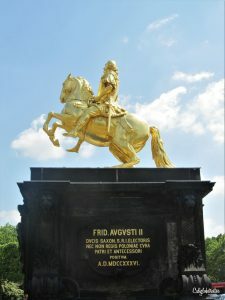 There is a big square that is dominated by the Goldener Reiter (Golden Rider) which was erected in 1736. This golden statue hints at the former glory that used to be the Neustadt before World War II which was unfortunately all destroyed. Now behind this statue is the tree-lined Hauptstrasse (Main Street) which is lined with shops. Finally after crossing back over the bridge, we went deeper into the Old Town Center and found the Frauenkirche which was built in 1726-43 and was then completely destroyed in 1945. The church was reconstructed to include pieces of the church which still remained. The ruins of this church would lie in a pile for the next 45 years and stood as a memorial until after 1994. The reconstruction of this church finally finished in 2005, a year before the city’s 800th anniversary. The church looks brand new but with signs of the war left behind. Just to the left, a small part of the original structure has been built into the new church. Inside the church is are beautiful pastel colors and the church has a unique shape and a tall domed ceiling to admire. 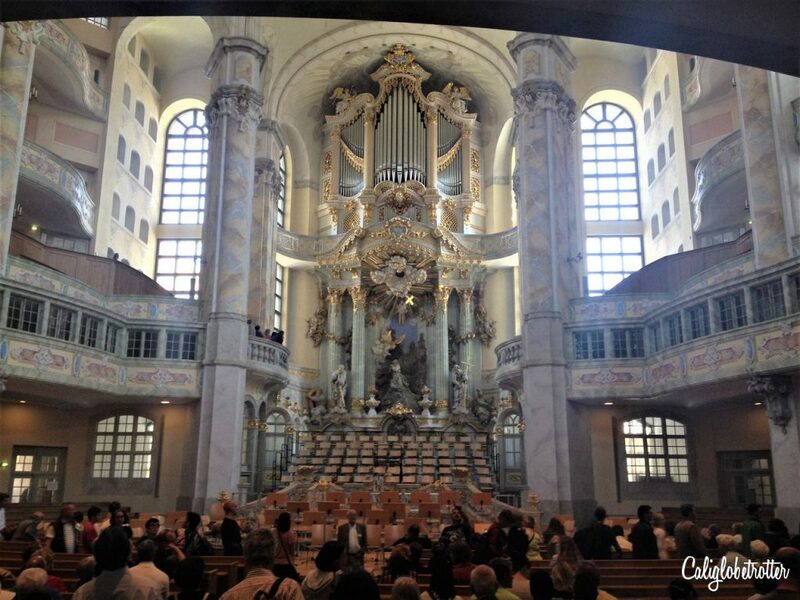 After checking out the Frauenkirche, we enjoyed a little piano show right in the middle of the main square. Then we did the touristy thing and mingled on down to a restaurant with a view of the Frauenkirche. It is so strange to sit in the middle of a square, knowing that at one point it had been completely demolished and this is now the result of hard work rebuilding the city to what it looked like prior to the war. One thing about living in Germany, is that you can’t live here without having a deep appreciation for the history of Germany and understanding how hard the people fought to build their cities back up from the ground and how hard they have worked to move on from the past and create a better future. Of all the cities I have ever visited in Germany, Dresden reiterated those thoughts more than ever before. Replies to Dresden for the day! My wife and I drove around much of Dresden in 1991. There was rubble still piled everywhere. We returned in 1994, and stayed in a hotel directly across the street from the Frauenkirche. They were starting the excavation around the ruins – people working with small trowels and brushes, pulling out and cleaning individual bricks to be reused. What dedication and effort. We watched for hours. We returned to the same hotel in 2006. 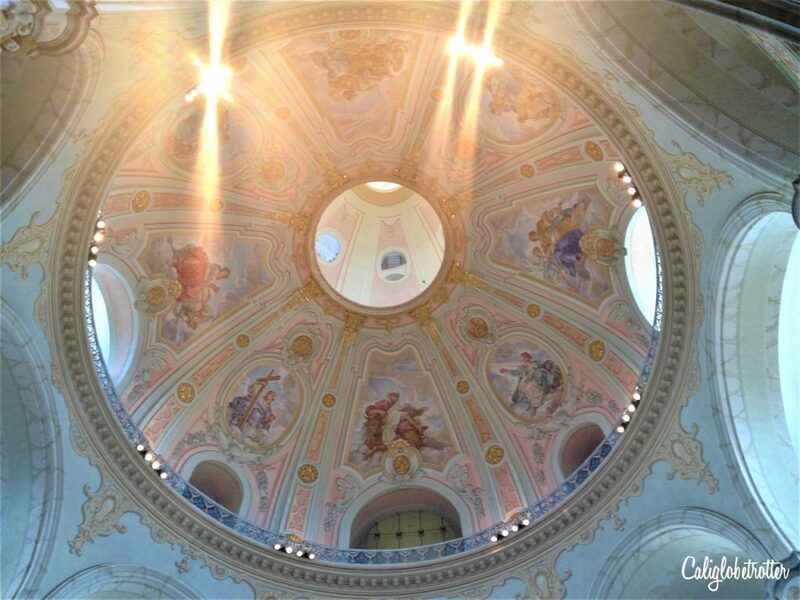 The restoration was complete, the excavation site was gone; a new plaza was built there with the Frauenkirche in the center. Across from the hotel now sits a multi-story building – business on the ground floor, and apartments above. Truly beautiful and a testament to the unending efforts of the German people and government. 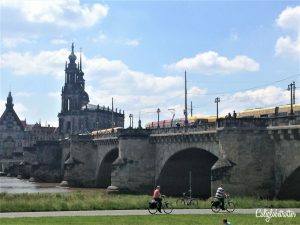 Dresden is certainly one of our favorite places to stay and tour, on our own, the back streets, shops, restaurants, etc. Wow what an amazing experience to get to witness that!! We were in Dresden almost by accident on the way to Prague. What a beautiful city! BTW we live in San Diego!